Dealers remain very competitive in today’s market. They are continually raising their buy prices for wantlisted coins with low availability. The profit margins can be very lucrative if they locate the right coins; for example Early Gold ($2 ½, $5, & $10) in XF and higher grades has tremendous support and many of the rare dates set new records every time they are offered for sale. 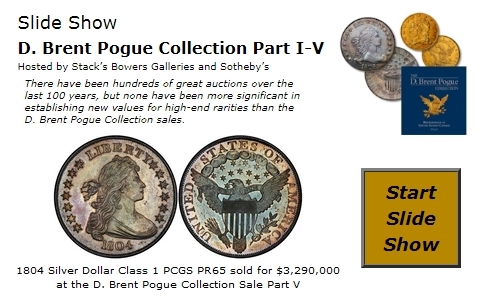 We seldom see any of the truly rare coins offered on the dealer teletype systems because these coins are quick sellers in the current market and usually go right into the hands of dealers’ best customers. Most activity on the teletypes is for modern coins, proof and mint sets, and modern bullion coins. The amount of activity for bullion continues to be phenomenal. With the metals being so active, this area responds directly to the swings of the individual metal. One series you may have noticed that is not so active today is Classic Silver Commemoratives. The amount of interest here at current levels is almost non-existent. Buyers are only interested if the coins are heavily discounted or they are extremely high end for the specific grade. At some point, lower prices should attract new interest.